This player analysis first featured on our dedicated analysis site, totalfootballanalysis.com. RB Leipzig has been on an upward trajectory since the outset. While Timo Werner has been a talismanic figure, his monstrous strike partner continues to fly under the radar. I am talking about the Danish striker Yussuf Poulsen. Hailing from Copenhagen, Denmark, Poulsen has been an important presence alongside Timo Werner, becoming a reason for his success. In an age where the lone striker system is the norm, Yussuf Poulsen has reincarnated the role of the second striker. The Dane has produced several performances that are reminiscent of partnerships of yesteryear. Like all outstanding partnerships, Werner and Poulsen have their respective roles in the team and perform them to the best of their ability. Across their two and a half Bundesliga seasons, the discrepancy between the two scoring records are staggering to the naked eye but after examination, you can understand the difference. Timo Werner has scored 42 goals across 76 games. How many has Poulsen scored? Well, the 6’3” striker has contributed 15 goals in 72 games yet remains an important figure in Leipzig’s attack. The Hulk to Timo Werner’s Radamel Falcao (I’m sure there’s a better striking duo but the modern day partnerships are a rare breed and the Brazilian-Portuguese duo), Poulsen’s all-round game has propelled Werner to scoring as many goals as he has. If goals are not the reason for his inclusion then what is? In this feature, we will review Yussuf Poulsen’s other attributes that make him an imperative member of Ralf Rangnick’s team. Die Rotten Bullen’s primary plan of action involves the centre-backs launching long balls towards the Poulsen whose hold up play allows for Timo Werner or the attacking central midfielder, usually Kevin Kampl or Marcel Sabitzer to attack. Yussuf Poulsen is more than just a target-man. The old-fashioned target-man was limited in function; their only contribution would come through their hold up play and heading. The modern-day centre-forward needs to have an all-round skill set to stay relevant, especially given the modern managers preference to play with a single striker. Let’s take a look at Chelsea F.C, they utilise Olivier Giroud and Alvaro Morata as complete-forwards. Both strikers have the ability to link up with their midfield, running in behind and holding up play for players like Eden Hazard, Willian, and Mateo Kovacic to make darting runs behind opposition lines. RB Leipzig follows a similar gameplan but instead of playing through the middle, the defenders the primary source of an attack. Whether it’s long balls from the centre-backs or crosses from the full-backs, Leipzig tries to keep the opposition guessing. Lucas Klostermann, Marcel Halstenberg, Nordi Mukiele, and Marcelo Saracchi are one of the first changes made off the bench and are vital to Leipzig’s style of play. Even Kevin Kampl and Marcel Sabitzer play the Mezzala role when Rangnick needs play to be stretched, moving out wide and supplying crosses for the strikers. This is Yussuf Poulsen’s heat map of the 2018/2019 season. We can see he plays a much deeper to receive the ball and his activity in the box is to get into scoring positions from a cross. Arguably, Poulsen’s most impressive trait is his work-ethic. The Danish forward works incredibly hard for RB Leipzig giving the likes of Timo Werner and Kevin Kampl every opportunity to score. Whether he drops deep to collect the ball, makes a quick run behind the opposition defensive line or runs the channels hunting down the opposition ball carrier, he puts in a shift in every game. The new era of football manager’s involves players pressing and tracking back in some capacity and for Leipzig, Poulsen acts as the teams pressing catalyst as the target man. This can only work because of the narrow system played by the East German club. When Ralf Rangnick plays a wide 4-3-3 players such Bruma press the opposition high up the pitch stopping them from playing out from the back. However, in his standard 4-1-2-1-2 formation, the support behind the Danish forward means he doesn’t need to win the ball rather just applies pressure. Against Hoffenheim, we see evidence of this early on in the game where Yussuf Poulsen has closed down the Hoffenheim defender near the corner flag. At this point, it would be easier for the defender to knock the ball out of play. One of the first lessons taught as a defender is to knock the ball out of play when you’re backed into a corner. The defender fails to play the ball and instead is won by the burly striker who attempts to dribble into the box but is faced by another adversary. Lukas Klostermann is a viable passing option if he so desires but instead knocks the ball past the second defender and finds himself in a situation to cross. The striker produced an early opportunity from nothing. Credit: Wyscout – Yussuf Poulsen with multiple passing options. An incredible work ethic is the basis of any footballers learning. Without a hard-working mentality, other aspects may lack the proper development. Yussuf Poulsen’s incredible performances for Leipzig have credited by his spectacular work-rate. The Danish striker has an underrated dribbling skill for a 6’3″ centre-forward. As I mentioned earlier, he invariably attempts 0.5 dribbles per game (44% win rate) but it’s not about the number of dribbles but rather the quality. There are moments in matches where dribbling it himself would open up better opportunities. In this Bundesliga game against VfL Wolfsburg, we can see how deep Yussuf Poulsen comes to receive the ball and with no viable passing option, Poulsen needs to carry the ball himself towards Wolfsburg’s goal. Credit: Wyscout – Back to goal. As he turns the defender, Poulsen is in a much better position to make a more threatening move. He even has the option to run into acres of space but his first thought is to always look for a teammate and get himself into a better position to score or assist. After he passes, he starts sprinting into a better position and makes himself available in the opposition penalty area. Credit: Wyscout – Gives the ball and starts moving to a better position. Linking up with your midfield as a striker is an important aspect of modern football. Roberto Firmino, Kun Aguero, Karim Benzema, Cristiano Ronaldo, and Luis Suarez are just a handful of names that interact with their midfield to devastating effect. Yussuf Poulsen’s strengths have been his ability to link up with his midfield. His ability to isolate and create space for his teammates has been a feature of his game. By drawing focus away from his teammates and onto himself, the forward backs himself to get out of tight situations due to his superior size and strength to make space. His ball-playing ability is impressive for his stature too. He may only attempt 0.5 dribbles per game but a 44% win rate is enough for the striker. Against Hannover, we can see Poulsen receive a lofted pass from Marcelo Saracchi. Notice the number of yellow shirts in the Danish striker’s vicinity, all of them focused on trying to rob the tall striker. Yussuf Poulsen will look to pass to Emil Forsberg (10) who has space to position himself into a more viable goal scoring or passing position. Poulsen shows an incredible first touch too. 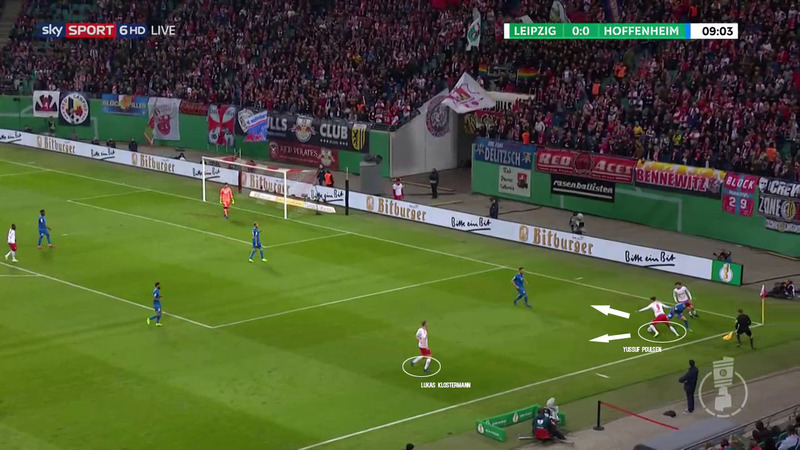 Credit: Wyscout – Nordi Mukiele in a crossing position for Timo Werner and Yussuf Poulsen. And suddenly, we see Mukiele in a good crossing position. Even here Yussuf Poulsen has pre-occupied the two centre-backs giving Timo Werner unmarked on the far side. The Hannover defenders are frantically trying to run back into position as a barrage of Leipzig players enters the box. Poulsen’s ability to head a ball is his greatest attacking asset. 10 of his 28 attempts at goal this season have been using his head. Four on target with one goal scored. A threat from set-pieces makes him a valuable asset in both boxes. Being a tall centre-forward, positioning is a vital component of Poulsen’s style of play. The 6’3’’ Dane comes out on top in over 52% of duels. Throughout this article, you may have noticed that Poulsen has consistently looked for a better position to be in to receive or deliver the ball. His goal tally may be low but when he does find himself in a goal scoring position his heading ability comes to fore. During matchday one of the UEFA Europa League match between RB Leipzig and FC Salzburg, Poulsen was introduced at half-time with the German team trailing 2-0 at halftime. His introduction changed the dynamic of the game. A few tactical adjustments by manager Ralf Rangnick brought the best out of the Dane and allowed the East German club to stage an impeccable comeback. They ultimately lost the game 3-2 but Poulsen’s impact was no doubt a turning point in the match and showcased his abilities as an all-round player. Kampl operated in the channels providing an extra layer of width and another crossing option for Danish forward Poulsen. They persisted and finally, Kampl’s persistence yielded results. His wider position was not tracked by the Salzburg midfield giving him enough time and space to produce a pinpoint cross to Yussuf Poulsen who obliged with a bullet header to draw the game level at 2-2 in the 83rd minute. The Danish striker asserted himself in the box with a powerful header after getting himself into a good position behind the FC Salzburg centre-back. Yussuf Poulsen has been the unsung hero in Leipzig. Ever since he signed a contract with the then 3. Liga German club in 2013, he has racked up a total of 168 appearances scoring 43 goals and more importantly provided the backbone to a team that needed stability and a driving force leading the line. Yussuf Poulsen is not one to take up the spotlight rather excelling in the shadows propelling his strike partner Timo Werner with the flashy goals. If the team keeps on winning then Poulsen is doing his job. His importance to the team goes deeper than pure statistics. At twenty-four, the towering Dane is yet to hit his stride and can only improve playing with and against better players. RB Leipzig currently sits third with 25 points having won seven games this season and performing admirably. Borussia Dortmund looks destined to win the Bundesliga breaking Bayern Munich’s dominance and with Eintracht Frankfurt and Borussia Mönchengladbach overachieving, Leipzig will once again look towards Timo Werner and Yussuf Poulsen to perform if they want to stand a chance in qualifying for the Champions League.